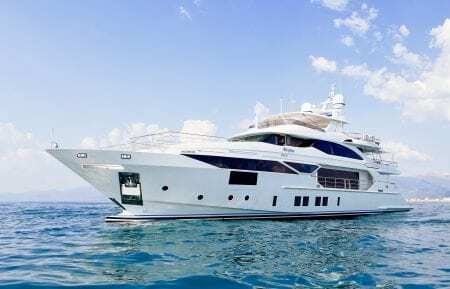 Delivered by Benetti in 2017, this VIVACE 125 motor yacht is a contemporary sublime vision of luxury. The rich textures include deep pile silk woven carpets, dark blue leather piping wall detail, Tanganyika frise, glossy ebony, and Thai woodwork; all of which offset the pale furniture and nickel detailing. INSPIRATION is equipped with the latest and fastest technology available and features the D2P hull; increasing cruising efficiency and maximizing onboard comfort. 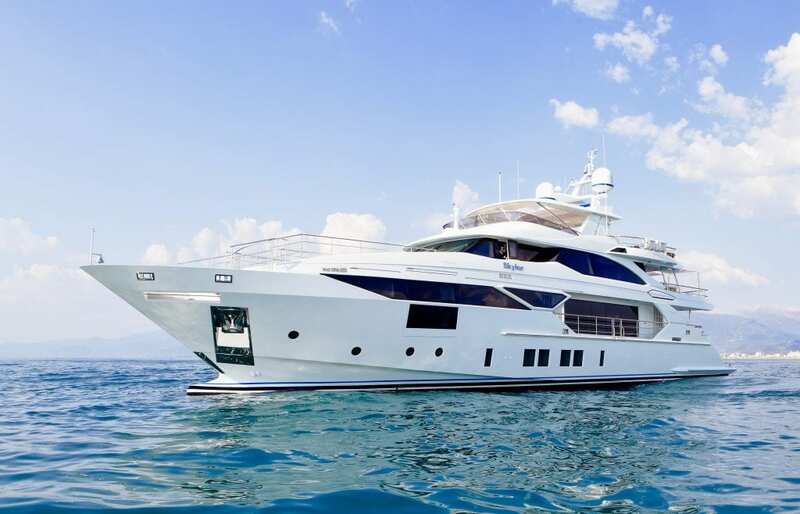 This spectacular superyacht offers accommodation for 10 guests in five cabins. The full beam master suite located on the main deck features unique terraces on both port and starboard side that slide out at the touch of a button. The lower deck houses three double cabins and one twin cabin. Guests staying in these cabins will appreciate the serenity and quietness INSPIRATION provides. INSPIRATION offers an impressive variety of choices over 3 decks for enjoying the outdoors which include optional well-placed awnings that provide plenty of shade. The stylish foredeck jacuzzi area is the ideal place to relax and watch the sunset on large sun pads with unobstructed ocean views. Alfresco dining for 10 is offered bridge deck aft on a modern circular dining table inlaid with glass and stainless steel. The spacious swim platform showcases a teak bar and overhead fresh water shower. By design, the sky lounge on INSPIRATION has an abundance of natural light flooding through the oversized windows. This tranquil comfortable space easily converts to a cinema with an impressive 85in (215.9 cm) TV screen. The separate gym, fully equipped with a Peloton Cycle, Octane’s xR6000 xRide recumbent home elliptical, an assortment of free weights and yoga equipment, is conveniently located on the upper deck amidships. INSPIRATION’s dedicated crew of 7 brings their warmth, enthusiasm, and a genuine joy to this outstanding charter program. Added to this, a full complement of fun water toys completes an unforgettable charter experience for all guests. All agreements to be drawn up using the current MYBA E-contract Charter Agreement – Revised 2017 version.